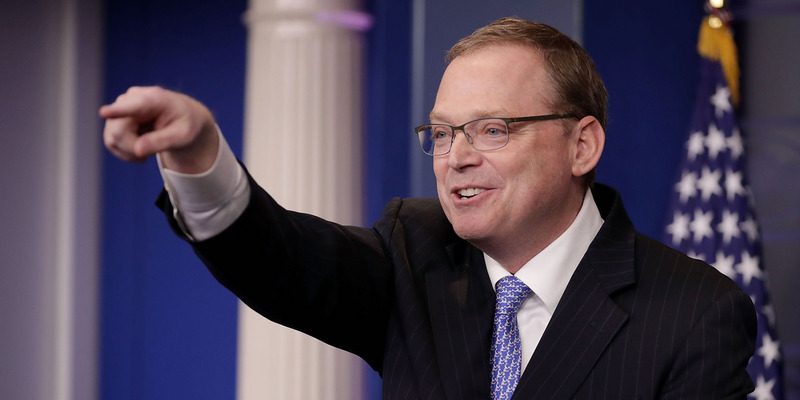 Chip Somodevilla/Getty ImagesWhite House Council of Economic Advisers Chairman Kevin Hassett. Kevin Hassett, the chair of President Donald trump’s Council of Economic Advisers, attacked the Goldman Sachs research team during an interview on CNN. Hassett was asked about a recent note from Goldman that estimated Trump’s threatened 25% tariff on all Chinese goods could wipe out any earnings gain from the stock market next year. “I haven’t read that report, but the Goldman Sachs economic team almost at times look like they are the Democratic opposition,” Hassett said. Hassett pointed to Goldman’s analysis of the GOP tax bill in 2017 as an example of the research department’s alleged bias against Trump. Kevin Hassett, the chair of President Donald Trump’s Council of Economic Advisers, on Tuesday took heavy aim at the Goldman Sachs research team, which he claimed was overtly political and negative toward Trump’s policies. Asked during an interview on CNN about a recent analysis by the Goldman equity strategy team, which showed Trump’s potential tariffs could wipe away from the stock market all the stimulative benefits of other policies, Hassett compared the analysts to the Democratic Party. In a note from the Goldman Sachs team released Monday, the analysts determined the possible impact on S&P 500 earnings if Trump goes through with a 25% tariff on all Chinese imports to the US. According to David Kostin, chief US equity strategist, such a move would wipe out any positive gains for the stock market. Hassett dismissed those concerns and pointed to Goldman Sachs’ previous analysis that the GOP tax cut bill would do little to boost economic growth as evidence the bank’s latest analysis was flawed. While GDP growth in 2018 has been strong, economists say it’s hard to determine just how much of a boost the tax law is giving economic growth and some argue that the effects of the tax law probably wouldn’t have hit economic growth yet since most Americans have not filed taxes under the new system. Hassett’s comments also come as the Trump team has taken an aggressive stance at defending the decision to start a trade war with China. For example, the president hit back at critics of the tariffs during a press conference announcing the new US-Mexico-Canada trade deal on Monday.